The History Of Modern Fashion From 1850, by Daniel James Cole and Nancy Deihl, justifies its definite article: it really is The history, not just A history. Almost 500 pages long, with over 600 illustrations, it's the first substantial and comprehensive history of modern fashion. As a survey of fashion since 1850, the book covers the entire history of the fashion industry, as the 1850s saw the introduction of commercial sewing machines (by Singer, amongst others) and the founding of the first professional fashion label (the House of Worth). While the book's main emphasis is on womenswear, each chapter also includes coverage of menswear and even childrenswear, both of which are often omitted from histories of fashion. The primary fashion centres (France, the US, Italy, and the UK) receive extensive coverage, though the book also recognises "the growth of the fashionable world over time", with Asian influences given more attention than in other histories of modern fashion. Auguste Racinet's Complete Costume History (reprinted in two volumes, edited by Francoise Tetart-Vittu) ended where The History Of Modern Fashion begins. Francois Boucher's excellent History Of Costume In The West (updated as 20,000 Years Of Fashion) surveyed the history of costume in Europe. Millia Davenport's Costume Book (in two volumes) covered European and American costume history. Patricia Rieff Anawalt's Worldwide History Of Dress and Leslie Steele's Encyclopedia Of Clothing & Fashion (three volumes) have extensive coverage of non-Western traditional dress. 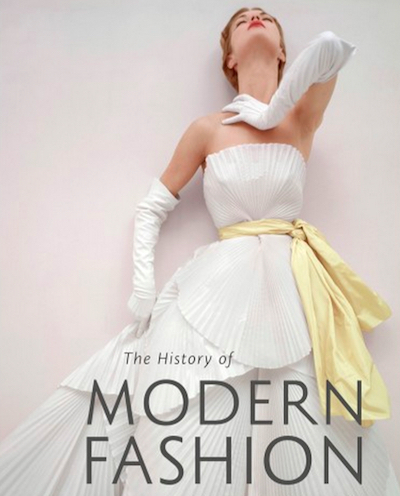 The History Of Modern Fashion's publisher, Laurence King, has also produced comprehensive histories of other fields of art and design, including A World History Of Architecture, A History Of Interior Design, Graphic Design: A New History, History Of Modern Design, and Photography: A Cultural History. Its flagship title is A World History Of Art.